Hey, here's a tiny Project X Zone update for you. While it's not much, I thought the Tron Bonne fans out there might enjoy the latest screens and info. If you recall, Project X Zone pits numerous characters from Namco Bandai, Capcom, and Sega games into battle. But how do they run into each other? According to Siliconera, Tron Bonne and Xiamou (of Namco X Capcom) are lost in cyberspace. In their travels, the pair end up in the fictional MMORPG The World. 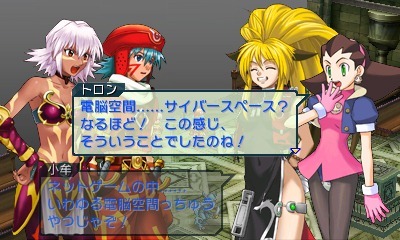 There, they meet .Hack leads Kite and BlackRose. Are they going to fight each other? Sure looks like it. I mean, it wouldn't be much of a game without that part, right? I'm so glad they stuck to the Anime/PS2 game style for Kite. The PS3 Kite just looks creepy. If he were to be in it, I'd actually import a JP 3DS just for this game. At first, I wasn't even interested in this game. Now I really am. Hope it gets localized. I feel that the whole cyberspace thing is a missed opportunity... to throw in EXE. Same as other anonymous, the fact that .hack characters were used, I feel that battle network characters should have been used also. Without being a spoiled sport, as much as i want this game here NOW to play, it will suffer the same fate as the SRW games, licences issues that keep it from appearing here. Although it would be amazing if somehow all were in agreement to bring it here. I wouldn't take that to the derivatives market and shortsell it Anon 3. X Edge got NA and PAL releases.